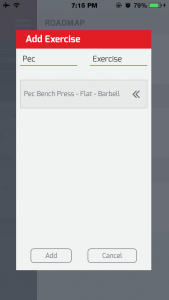 Step 1: Click on the Menu button and select “FreeStyle Workout”. Step 2: After selecting FreeStyle the system will immediately ask for your first exercise. 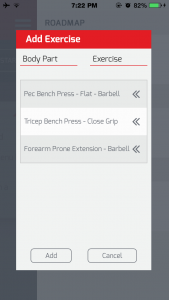 You can filter exercises by body parts – the exercise menu will be restricted to just those exercise to simplify your choice. Note: To add another exercise for a different body-part, just select the “Body party” and select an “Exercise”. When you have enough selected click “add” to add exercises in to program. 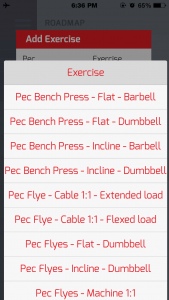 See the image below which has multiple exercises added in the program. Note that when you select “Add” the system will go to the first exercise, ready to begin. 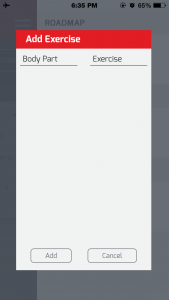 You can return to this mode to add more exercises any time by selecting “Add Exercise” while you are still in the workout. 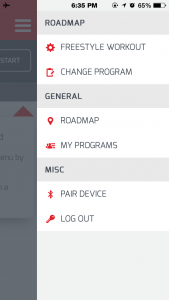 (Note, “add exercise” does not appear in the menu if you are at the “Roadmap” screen because you are not technically “in” the workout – you need to press “Start” to get “into” the workout – to either perform exercises, or add new ones.